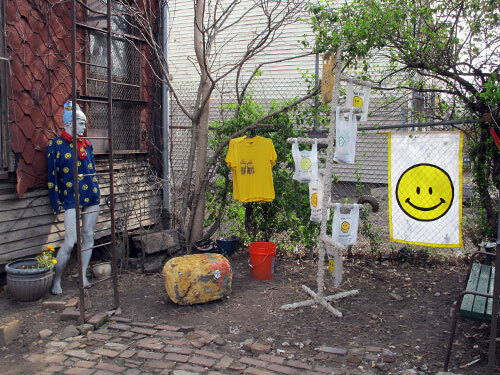 The Courtyard of the Brooklyn Smile Face Museum, 2014. 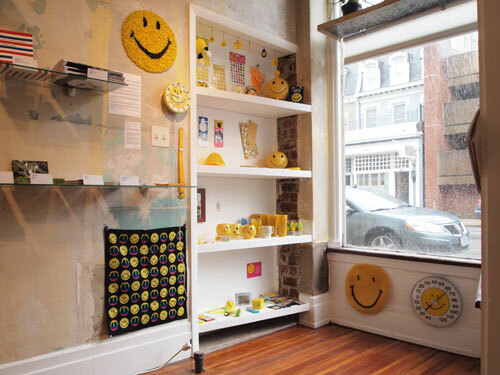 The Smile Face Museum was open to the public in Brooklyn, New York March 30 - April 27, 2014 at 228 ½. 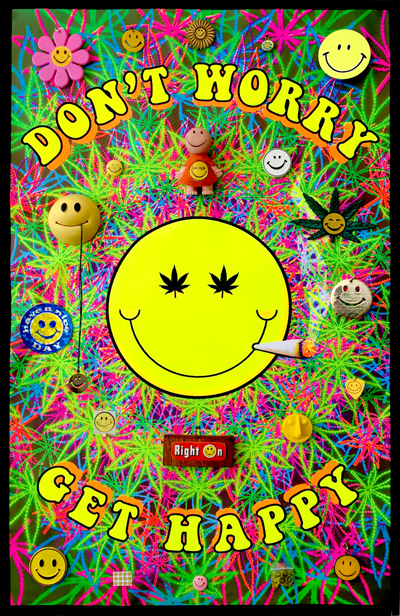 The 2014 Smile Face Museum Calender is available here. The Communicator, March 30 - April 1, 2014. The Communicator Checklist is available here. Reception at The Peter Prescription, April 6 - April 8, 2014. The Peter Prescription Checklist is available here. April 2014 Installation of Real McCoy. Sculpture Courtyard with work by Alex DeCarli, Jesse Harding, Jen Kirsten and Sean Monaghan, and Shabd Simon-Alexander. The Real McCoy Checklist is available here. Collection of Katie Kline, 2014. Tattoo by Adrienne Garbini. 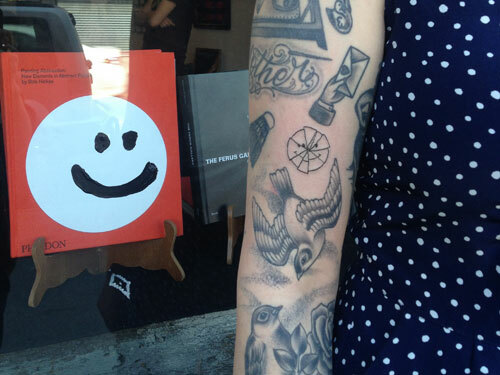 Smile face tattoo special at Black Square Tattoo and Book. Carmelle Safdie's Choices Swap Meet, with BBQ, and Guess Jar Raffle! 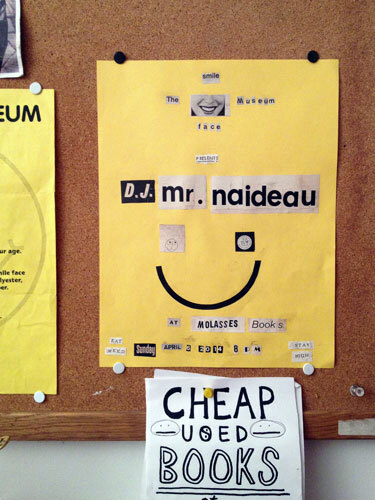 The Smile Face Museum at Sediment, 2014. From March 29 to May 17, 2014 the artist-run space Sediment in Richmond, Virginia hosted a satellite exhibition of duplicates from the collection and special editions from The Museum shop. Special thanks to Claire Zitzow and Gary Stevens. 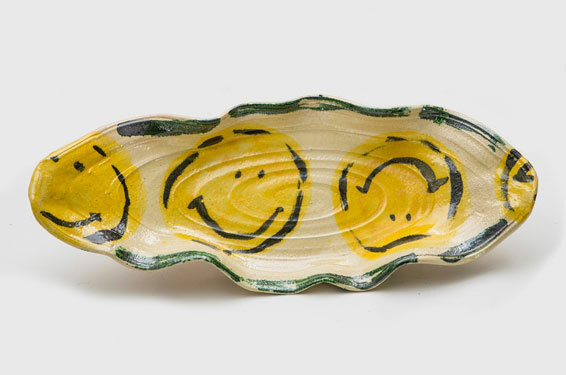 Betty Woodman, Smiley Face Platter, 2014. Glazed earthenware, epoxy resin, lacquer, acrylic paint. 21" x 9" x 3". Image courtesy of Salon 94. 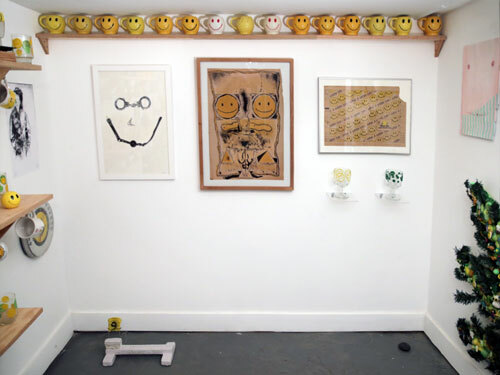 The Smile Face Museum traveled to Frieze London in the fall of 2014 in a collaboration with Salon 94. The exhibition was on view at Regents Park from October 15 - 18, 2014. This exhibition of the Smile Face Museum featured selections from our permanent collection, alongside the work of Joshua Abelow, Nick Atkins, Daniel Albrigo, Darren Bader, Donald Baechler, Stefani Baron, Katherine Bernhardt, Olaf Breuning, Ken Brown, Tom Bunk, Phoebe Collings-James, E. Conner, Catherine Czacki, Alex Da Corte, Alex DeCarli, Jeremy Deller, Kemi Dial, Marcel Dionne, Drainbowland, Ben Echeverria, Mary Frey, Karl Fritsch, Adrienne Garbini, Jack Greer, Gene Hahn, Jesse Harding, Janet Hartman, Andy Holden, Jonathan Horowitz, Katsu, KAWS, Sandy Kim, Kenny King, Katie Kline, Dust La Rock, Kricket Lane, Austin Lee, Hanna Liden, Gregg Louis, Nate Lowman, Aranzazu Pola Manríquez, Carly Mark, Itsumi Max, Dan McCarthy, Pat McCarthy, Adam McEwen, Matt Merkel Hess, Marilyn Minter, John-Mercer Moore, Jane Moseley, Takeshi Murata, Sophy Naess, Tony Oursler, Isaac Nichols, Grear Patterson, Oliver Payne, Eddie Peake, Joyce Pensato, PettalWorks, Pablo Picasso, Richard Prince, Jason Polan, Debbie Powers, Brie Ruais, Borna Sammak, Aurel Schmidt, Bailey Scieszka, Jim Shaw, Michael St. John, Devin Troy Strother, Baron von Fancy, Nari Ward, Rhea Wiersema, Chloe Wise, Jordan Wolfson, Betty Woodman, Carmen Yoho, Joe Yorty, and Liz Zanis. 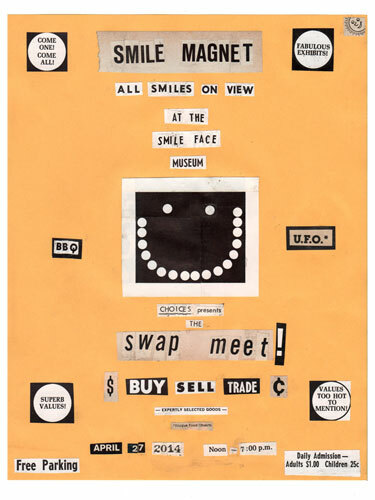 For more information, download the Salon 94/Smile Face Museum Press Release here. 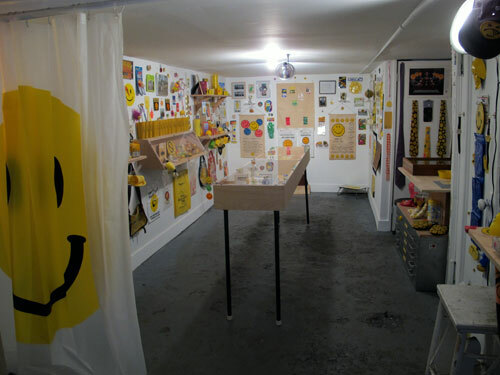 From October 4 to 16, 2016 the artist-run space Mothership in Woodstock, New York hosted a exhibition of the Smile Face Museum. Special thanks to Paul McMahon.